Happy Friday, everyone! Hope you all had a great week. I can't believe it's February! January is over with, but I am still sorting, organizing, and purging things from our home. It's been a slow process since I can't do much while the baby is awake. I have been making progress though, so I am happy about that. I don't think I will be satisfied until I simply cannot find anything else to donate or get rid of. I'm on a mission!!! LOL! Well, I am really enjoying my stint as a DT member for Forever Night Challenges. I've discovered some really fun digi companies because of my DT assignments. One of my newest faves is The Saturated Canary. OMG! Krista's digi's are just so pretty and fun to color ! I am in LOVE!!! The Saturated Canary happens to be our sponsor this week. The challenge is : red, black, white, and gray. I had a lot of fun with this color combination, and I must say that this is one of my favorite cards so far this year. I used a digi called "One Of Those Days". Poor gal ! I know we've all had our fair share of gloomy days, right? LOL I colored her with Copics in the challenge colors. The sentiment was computer-generated. 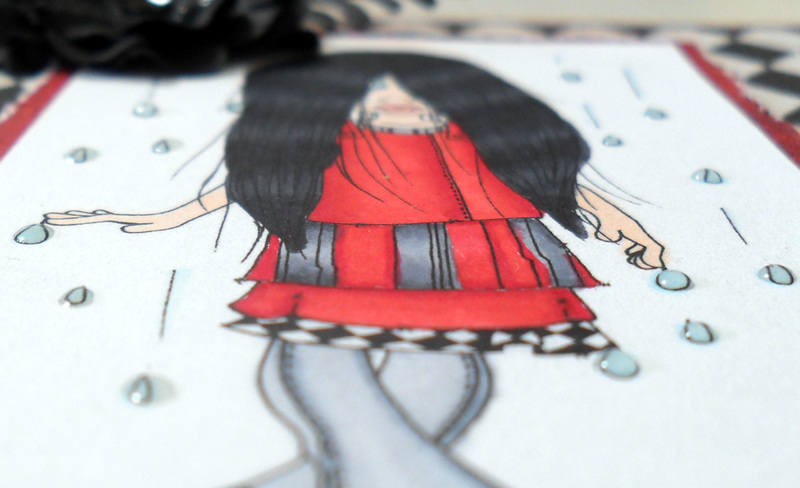 I added Glossy Accents to the raindrops to make them look wet and to add dimension. I also added Glossy Accents to the flower and leaves. The flower is from Prima. It's actually three flowers that I layered together. The center is a sequin that I flipped over. She is fabulous! Love the glossy accents on the drops-you can see them well in the photo. Yes Krista has some amazing images I wish I could own all of them... LOL!!! Love your card and the colour combo too.... I'm surprised you didn't grab her freebie she had on the other day? 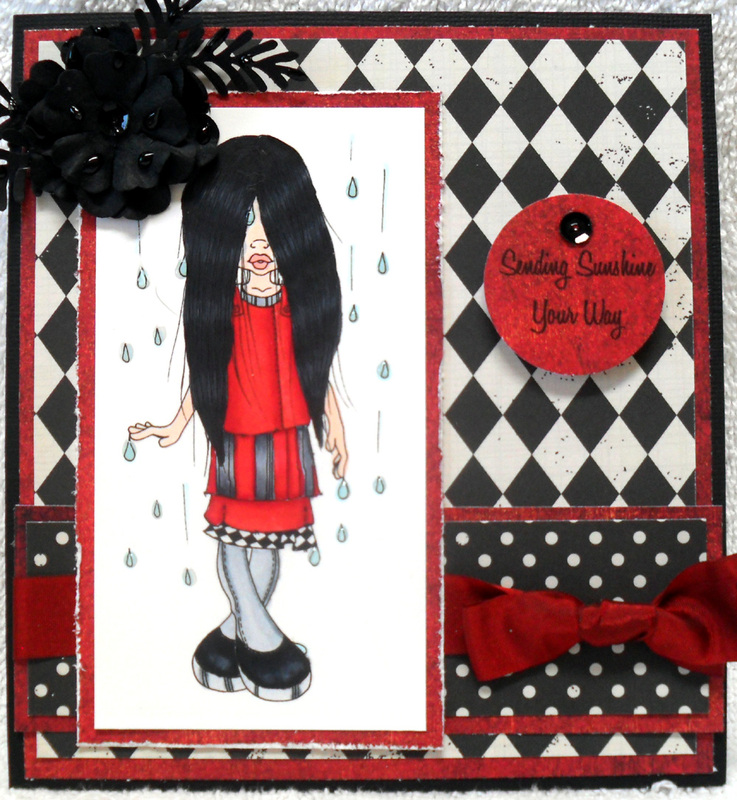 Awesome card D girl! Love how you used the Glossy Accents! Keep organizing and purging and before you know it, you'll be done! Have a great weekend and see you on FB! xoxo! 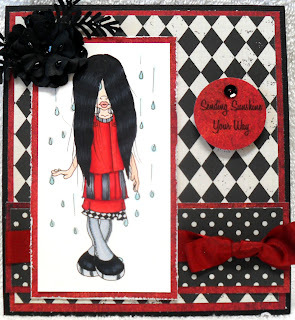 Love the coloring on the card and the color choice is fabulous!